PITTSBURGH — On a cold and wintery day on Neville Island, the Robert Morris men’s hockey team (9-17-1, 8-12-1 AHA) dropped a 6-2 decision to the Sacred Heart Pioneers (9-13-3, 8-9-2 AHA).The Colonials had never lost to Sacred Heart at home before tonight, and head coach Derek Schooley said that,“nobody is going to feel sorry for us,” referring to the Colonials success in the American Hockey Association over the past 10 years. To start things off, Sacred Heart came out flying, as they struck early in the game as rebound off a wraparound by Nick Boyagian found the stick of Vito Bavaro, who stuffed it home with only 3:10 gone in the first. Bavaro scored again, less than two minutes later, beating Francis Marotte’s five-hole to make it 2-0 Pioneers. A shot by Nick Lalonde with just over 10 minutes remaining almost got the Colonials to within one, beating Pioneers goaltender Nick Benson, but ringing off the outside of the pipe. Francis Marotte was called on for the Colonials while Justin Addamo was serving a two minute penalty for head contact, which robbed Austin McIlmurray on a one-timer from the right dot. Luke Lynch had a great chance for Robert Morris midway through the first, as he toe-dragged around the defender, and forced Josh Benson to make a blocker save. With 2:40 remaining in the first, Luke Lynch brought the Colonials to within one, putting home a loose puck after a scramble in front of the Sacred Heart net. With 1:06 remaining in the first, the Colonials had a great chance while Marc Johnstone of Sacred Heart served a two minute penalty for holding. However, Sacred Heart killed 1:07 of it before the buzzer went off to signal the end of the period. After one period, Sacred Heart led Robert Morris 2-1, with both of the Sacred Heart goals going to junior Vito Bavaro. Ryan Steele had two assists in the period as well. For the Colonials, the lone goal was scored by Luke Lynch. The assists went to Alex Tonge and Aidan Spellacy. Robert Morris was led in shots 13-10, and both teams went 0-1 on the power-play, with the Pioneers having 0:53 left to kill to start the second. Nick Lalonde led the Colonials with three shots, and Vito Bavaro had three for Sacred Heart; two of them finding the back of the net. At the start of the second, the Colonials spent the first minute deep in the Sacred Heart end and benefitted by the 0:53 of rollover time in the Marc Johnstone penalty. The game started to get physical early in the second, after a heavy hit by Kyle Horsman for the Colonials created some bad blood between the two Pennsylvanian foes. Midway through the second period, the Colonials got a chance on a zone entry followed by a spin-o-rama by six foot six freshman Justin Addamo, but the puck rang off the pipe. At the 10:10 mark of the second period, Aidan Spellacy deflected a shot by Alex Robert over the right shoulder of Pioneers netminder Josh Benson to tie the game at two apiece. With just over five minutes remaining, Alex Tonge put his defender through the washing machine, but Josh Benson was able to make the save in net for Sacred Heart. The Pioneers scored with 4:40 left to make it a 3-2 lead. Matt Tugnutt, the son of former NHL goaltender Ron Tugnutt was able to put a rebound past Marotte. After penalties to both Eric Israel for Robert Morris and a too many players penalty on Sacred Heart (served by Stephen Hladin), it was time for some action packed 4-on-4 hockey. Francis Marotte made two saves for Robert Morris. The Pioneers again took a penalty in the period, this time to Austin McIlmurray for high sticking. Robert Morris wasn’t able to get a chance on the man advantage, as the buzzer went off with 1:21 remaining in the penalty. At the end of two, the Colonials were down 3-2. Aidan Spellacy scored for the Colonials in the second, while Matt Tugnutt scored for Sacred Heart. Aidan Spellacy and Alex Tonge both had two points for the Colonials. 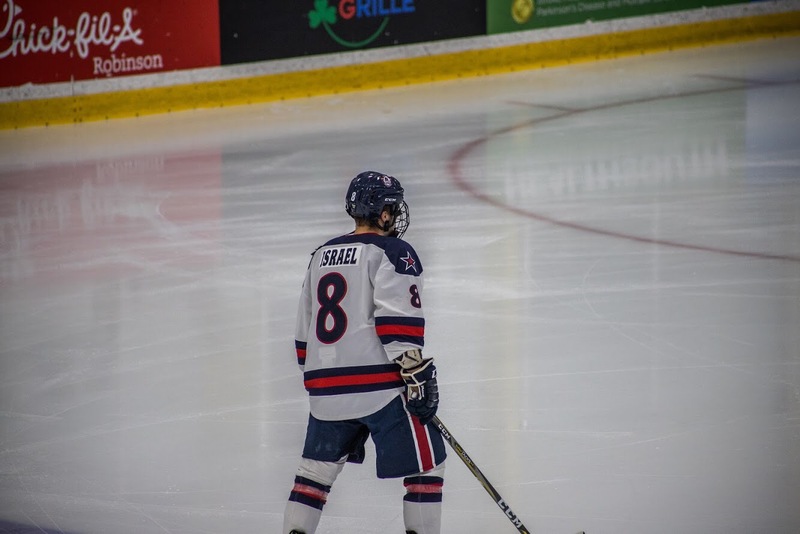 At the beginning of the third, the Colonials had a minute twenty one remaining on the power-play, but they were only able to get two shots on net, both by Grant Hebert. Midway through the period, and after a reviewed penalty on Brandon Watt that led to a Sacred Heart powerplay, freshman Nick Boyagian scored to make it 4-2 Pioneers. On yet another powerplay, with 10:03 remaining in the third, Sacred Heart scored to make it 5-2. Austin McIlmurray lasered a one-timer over Marottes right shoulder. Marotte was replaced in the game by sophomore Dyllan Lubbesmeyer. This was Lubbesmeyer’s sixth game of his career. Up to this point, he had a 1.49 goals against average and a .917 save percentage. The Pioneers struck yet again to make it 6-2 when Austin McIlmurray scored his second of the night, and second in a row putting home a rebound off a Matt Tugnutt shot that Lubbesmeyer had no chance to stop. After an Austin Magera tripping call with 4:41 remaining in the third, the Colonials were on their fourth power play of the night, however it ended up the same way all the others had. At the final buzzer, the final score was 6-2. Sacred Heart outshot the Colonials in the game by one, 31-30. However, special teams played a huge role in this one, with Sacred Heart going 2-5 on the power play, and Robert Morris going 0-4 with the man advantage. The Colonials look to spring back as they face Sacred Heart tomorrow at Colonials Arena. Puck drop is at 4:05, and the first 800 fans to the game will receive a free winter hat.